Two Newcastle United fans travelling to watch their team play in a pre-season tour of New Zealand were on board the Malaysia Airlines flight MH17 which crashed in Ukraine. John Alder, who was in his 60s and from Gateshead, had reportedly missed only one Newcastle game since 1973. Liam Sweeney, aged 28 and from Newcastle, had also boarded the flight destined for Kuala Lumpur. Newcastle are due to play two fixtures in the New Zealand cities of Dunedin and Wellington next week. 2 Geordies on plane MH17 travelling to watch Nufc in New Zealand. 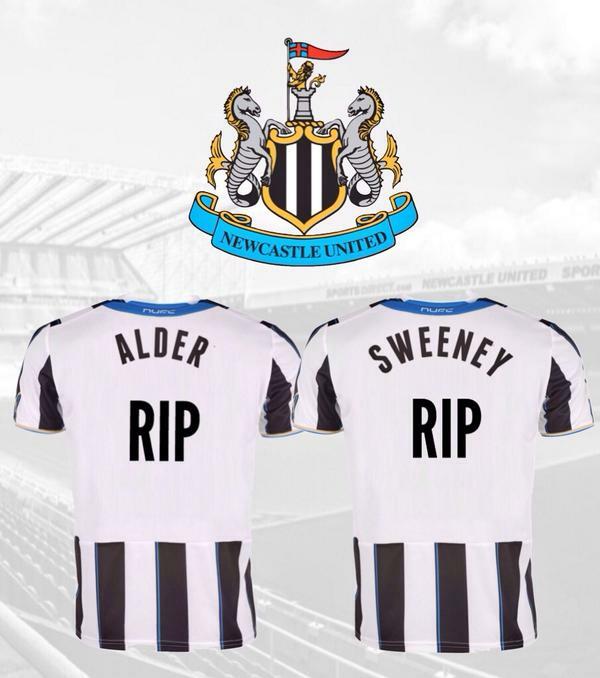 RIP John Adler and Liam Sweeney.. Our thoughts are with all the families! We are deeply saddened to learn that two members of the #NUFC family lost their lives on board Malaysia Airlines flight MH17 yesterday. The loss of John and Liam is truly devastating news. Both men were dedicated supporters of our Club and were known to thousands of fans and staff alike. On behalf of everyone at Newcastle United we send our deepest condolences to John and Liam's families and friends. The Club will be dedicating an area surrounding the Sir Bobby Robson statue for fans to pay their respects to John and Liam. The manager and players will also be wearing black armbands for both their games against Sydney FC and Wellington Phoenix in the Football United Tour of New Zealand. We're desperately sad to report that they were John Alder and Liam Sweeney. Both were well known to away followers, particularly John, whose usual matchday attire led to the affectionate nickname of "The Undertaker". Both were in attendance at Oldham on Tuesday, doing what they loved. Our thoughts are with their friends, families and the many fans who knew them by sight. Watching Newcastle will never be the same again. A memorial image posted on Twitter by the fan account @gallowgateshots was retweeted hundreds of times. R.I.P. to everyone who lost their lives on the crash, but especially the two NUFC fans. Doesn't matter that I support SAFC, we should unite! Nine Britons are thought to have died in the crash, which has killed more than 300 people.